Shine Bright With The Diamonds! Get Ready for the 2019-2020 season! Pre-Tryout Clinics and Tryout dates are below. We will field 5-6 teams of varied skills and ages. Possible levels include: Synchro skills 1/2/3, Preliminary, Pre-Juvenile, Open Juvenile, Intermediate, Novice and Open Adult. Skaters ages range from 5-18 year olds, and adults. $10 per clinic date. $15 tryout fee. Payable upon arrival. 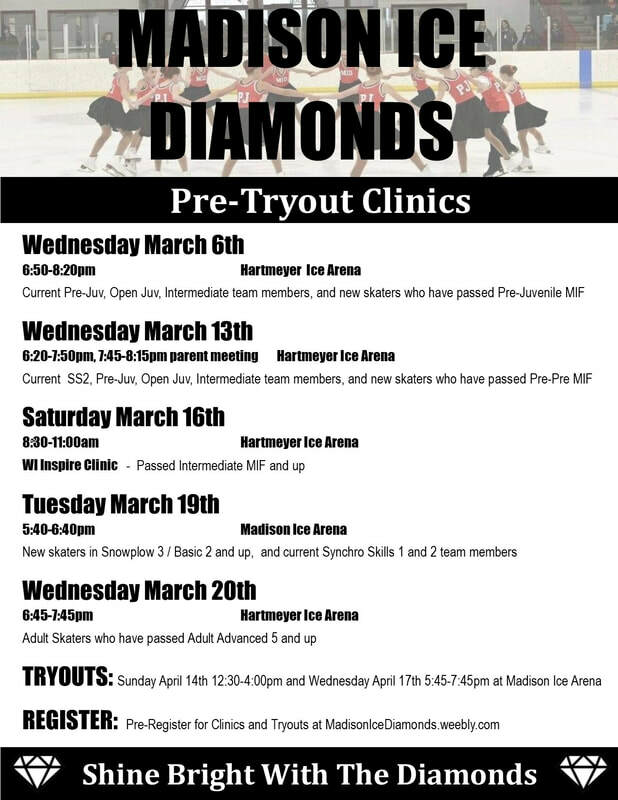 Email us at madisonicediamonds@gmail.com with questions! Questions? Contact us at madisonicediamonds@gmail.com. WE ARE A PROUD MEMBER OF THE WISCONSIN INSPIRE COOPERATIVE! THE WISCONSIN INSPIRE COOPERATIVE brings together skaters and coaches in Southern Wisconsin who share a passion for synchronized skating. Members of the Wisconsin Inspire Cooperative learn more about the world of synchronized skating while sharing their knowledge of the sport. In addition, members have access to training clinics and camps to build their skating skills. In the years to come, the Wisconsin Inspire Cooperative will be more than just a network of skaters and coaches who have a love for synchronized skating. With no single club affiliation, this program will provide an opportunity to skate on an elite IJS level synchronized skating team while still representing a skater's home club.